Objective People with multiple sclerosis (MS) have difficulties with decision-making but it is unclear if this is due to changes in impulsivity, risk taking, deliberation or risk adjustment, and how this relates to brain pathology. Methods We assessed these aspects of decision-making in 105 people with MS and 43 healthy controls. We used a novel diffusion MRI method, diffusion orientational complexity (DOC), as an index of grey matter pathology in regions associated with decision-making and also measured grey matter tissue volumes and white matter lesion volumes. Results People with MS showed less adjustment to risk and slower decision-making than controls. Moreover, impaired decision-making correlated with reduced executive function, memory and processing speed. Decision-making impairments were most prevalent in people with secondary progressive MS. They were seen in patients with cognitive impairment and those without cognitive impairment. On diffusion MRI, people with MS showed DOC changes in all regions except the occipital cortex, relative to controls. Risk adjustment correlated with DOC in the hippocampi and deliberation time with DOC in the medial prefrontal, middle frontal gyrus, anterior cingulate and caudate parcellations and with white matter lesion volumes. Conclusions These data clarify the features of decision-making deficits in MS, and provide the first evidence that they relate to grey and white matter abnormalities seen using MRI. Impaired decision-making is seen in people with relapsing–remitting (RR)1 ,2 and progressive forms of multiple sclerosis (MS).3 It may be detected in the early stages of the disease,2 and is known to deteriorate over time.4 Impaired decision-making is of clinical relevance as it impacts on treatment compliance,5 employment6 and function in everyday life.1 However, it is unclear exactly which components of decision-making are most affected, and whether or not these differ between MS subtypes. Effective decision-making requires processing information, forming preferences, selecting and executing actions and assessing outcomes. Impaired decision-making can therefore reflect a variety of problems, including difficulties in assessing outcomes, increased impulsivity and poor adjustment to risk. MS studies have used the Iowa Gambling Task,7 a test providing a general measure of decision-making, but not of its separate components. Abnormal performance in different neurological populations has been variously linked to impairments in working memory,8 risk taking9 or emotional response to feedback.10 MS studies using the Iowa Gambling Task have not found correlations with performance on tests of executive function, working memory or processing speed,1 ,2 ,11 and it has been suggested that impaired decision-making may reflect poor learning of outcomes2 or mood-disturbance.4 It remains to be determined whether impulsivity and poor adjustment to risk also play a role in MS. No associations have been reported between impaired decision-making and MRI abnormalities in MS, and the contributions of grey matter (GM) and white matter (WM) pathology remain to be determined. In this study, we used the Cambridge Gambling Task (CGT,12) to assess decision-making. As opposed to the Iowa Gambling Task, which relies on implicit learning of outcomes, the CGT gives participants explicit information about outcome probabilities (figure 1). In doing so, it can independently measure impulsivity, risk taking, deliberation and risk adjustment. A screenshot from the Cambridge Gambling Task (CGT). In the CGT a token is randomly placed in 1 of 10 coloured boxes. The boxes are either red or blue, and the proportion of each varies between trials. The participant is asked to predict which colour box contains the token, and gamble points on this. For each trial, the amount bet automatically increases or decreases with time until a decision is made. Functional MRI studies in healthy adults demonstrate that networks involved in decision-making are widespread, including dorsolateral and medial prefrontal cortices,13 the hippocampus14 and striatum.15 Neuropsychological studies also highlight the role of prefrontal cortices and the striatum in decision-making, with impairments observed following lesions to the ventromedial prefrontal cortex16 ,17 and in those with conditions affecting frontostriatal circuits, such as Parkinson's disease and Huntington's disease.18 However, to the best of our knowledge, the structural substrates of decision-making deficits in MS have not been investigated. We recruited 105 participants with MS (61 RR, 26 secondary progressive (SP) and 18 primary progressive (PP)) who had not experienced a relapse or received corticosteroids within the preceding 4 weeks (table 1). Their median Expanded Disability Status Scale (EDSS) score was 5 (range 0–8.5) and their mean disease duration was 14.9 years (range 1–45 years). We also examined 43 healthy volunteers with no known neurological or psychiatric disorders. MS subtypes were classified as per Lublin and Reingold criteria.20 We obtained written informed consent. Cognitive assessment was conducted by an experienced neuropsychologist usually on the same day as scanning. Full details of the cognitive battery and CGT are presented in the online supplementary material. Briefly, in the CGT a token is randomly hidden in 1 of 10 boxes. The boxes are either red or blue, and the proportion of each varies between trials. 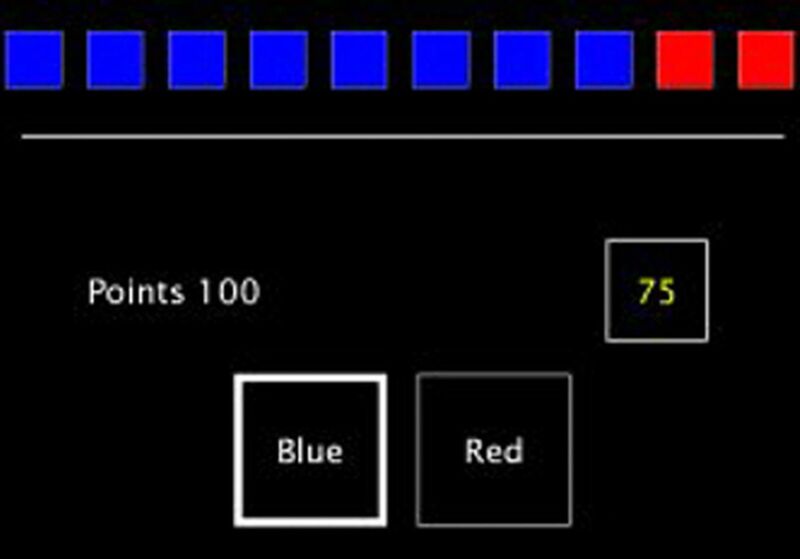 The participant is asked to predict which colour box contains the token, and gamble points on this. For each trial the amount bet automatically increases or decreases with time until a decision is made. The results of the CGT are broken down into: (1) rational-choices, the proportion of trials in which the participant chooses the likely outcome; (2) deliberation time; (3) amount bet; (4) impulsivity index, the difference in percentage bet in ascending and descending conditions (consistent early bets produce a high impulsivity index); and (5) risk-adjustment index, the adjustment of bets to match the odds. Patients were classified as cognitively impaired if they scored 1.96 SDs below the mean of the controls (ie, at the p<0.05 level) on two or more cognitive tests (Hayling overall, Stroop B time, Story memory immediate recall, Story memory delayed recall, Figure recall immediate, Figure recall delayed, symbol digit modalities test). Working memory, as measured using the Wechsler Adult Intelligence Scale-III (WAIS-III) digit span test, was also assessed and compared between the cognitively impaired people with MS, those who were cognitively unimpaired and healthy controls. EDSS21 scores were determined for patients. MRI data were acquired to look for associations between structural brain abnormalities and decision-making deficits. Based on previous work, DOC derived from diffusion imaging19 was used to look for microstructural GM tissue changes and volumetric imaging to look for tissue atrophy, both of which may be associated with cognitive deficits. High angular resolution diffusion imaging (HARDI) scans were obtained using a cardiac-gated spin-echo echo-planar sequence acquired axial-oblique and aligned with the anterior commissure (AC)-posterior commissure (PC) line (2 mm×2 mm×2 mm, 61 isotropically distributed diffusion-weighted directions with b=1200 s/mm2, 7 non-diffusion-weighted (b=0) volumes, TE=68 ms, TR ∼24 s (depending on cardiac rate), SENSE factor=3.1). Dual-echo proton density/T2-weighted axial-oblique scans aligned with the AC-PC line (1 mm×1 mm× 3 mm, TR=3500 ms, TE=19/85 ms) and 3D sagittal T1-weighted fast field echo (FFE) scans (1 mm×1 mm×1 mm, TR=6.9 ms, TE=3.1 ms) were also acquired. The HARDI scans were processed in native participant space. For each participant the T1-weighted FFE scan was registered to the HARDI data set (see online supplementary material). All registrations (except eddy-current correction) were carried out using NiftyReg (http://sourceforge.net/projects/niftyreg22). An experienced rater (VS) determined whole brain WM lesion volumes on the PD/T2-weighted scans using a semiautomated tool in JIM V.6.0 (Xinapse Systems, Leicester, UK). On the basis of previous decision-making studies,13–15 ,23 a set of a priori parcellations (medial prefrontal cortex, middle frontal gyrus (ie, dorsolateral prefrontal cortex), anterior cingulate, hippocampus and caudate) from the Harvard-Oxford atlas24 were transformed into native diffusion space and masked with GM tissue masks. These parcellations were chosen a priori given their well-known involvement in decision-making and to average MRI values across anatomical features, in line with previous studies.23 Regional specificity was assessed by examining changes in the occipital pole, a region where pathology would be unlikely to contribute to decision-making. Mean diffusion-based measurements were extracted from left-sided and right-sided parcellations and mean scores across both were used, as previous studies in people with traumatic brain injury23 report impaired CGT performance related to bilateral diffusion abnormalities. GM volume within each parcellation (in native T1 space) was measured using SPM8 tissue maps binarised with an in-house maximum likelihood algorithm. Total intracranial volume was quantified by summing the GM, WM and CSF volumes from the binarised whole brain tissue maps. The study did not aim to investigate regional cortical atrophy, but at detecting the subtle regional GM abnormalities using DOC. However, using the measure of GM volume in the same parcellation allowed us to control for the possible effects of brain atrophy. Group differences in demographics, clinical scores and decision-making measures were tested between controls and people with MS using unpaired t tests and χ2 tests, as appropriate. All data were checked for normality on skewness and kurtosis measures. Non-normally distributed data was analysed using Spearman correlations or Mann-Whitney tests, as appropriate. An executive function z-score was produced by averaging z-scores on the Hayling and Stroop tests (in each case based on the number of SDs from the mean of controls). Processing speed was measured using the symbol-digit modalities test (SDMT;25), for which z-scores were obtained with reference to published norms.26 Immediate and delayed memory was assessed using the story recall (verbal memory) and figure recall (visual memory) from the adult memory and information processing battery.27 A memory function z-score was produced by averaging z-scores on the immediate and delayed visual and verbal memory tests (based on the number of SDs from the mean of the controls). Pearson correlations assessed associations between decision-making components and either executive function, memory or processing speed in people with MS alone, and in controls alone (correcting for the three correlations using Bonferroni's method, ie, α levels of 0.017. Correlations with p values that fall between 0.05 and this value are considered non-significant trends). Participants were classified as being impaired on a given decision-making component if they scored >1.96 SDs (ie, at the p<0.05 level) below the control mean. Differences in decision-making on each component were further assessed between clinical subgroups using a multivariate analysis of variance (MANOVA) with clinical subgroups as independent variable. Significant differences were followed up using post hoc Tukey's tests to assess differences between pairs of groups. Differences in diffusion and volumetric MRI measures between groups were initially assessed using unpaired t tests (corrected for multiple comparisons). For diffusion MRI measures, univariate analyses of covariance covarying for GM volume within a given parcellation was also undertaken. Pearson correlations were assessed between decision-making components that were impaired in people with MS and the diffusion-based and volumetric measures in each of the cortical parcellations (correcting for the five parcellations of interest using Bonferroni's method, ie, α values of 0.01; correlations with p values that fall between 0.05 and this value are considered non-significant trends), as well as with T2 lesion volumes. Linear regressions assessed whether decision-making components were best predicted by DOC or GM volume normalised to total intracranial volume (ie, atrophy). SPSS V.21 was used for all statistical analyses. Comparisons between DOC and conventional DTI measures are given in the online supplementary material. The MS group did not differ from controls in their estimated premorbid IQ (p=0.19), but showed lower verbal (p<0.001), performance (p<0.001) and full scale (p<0.001) IQ than controls (table 2). The MS group had slower processing speed than controls on the SDMT (p<0.001) and worse executive function (Hayling, p=0.005; Stroop, p<0.001). On tests of memory, the MS group showed worse immediate (p<0.001) and delayed (p<0.001) story recall, and worse immediate (p<0.001) and delayed (p<0.001) figure recall, relative to controls. Patients had significantly lower scores than controls on the executive function z-score (p<0.001) and memory function z-score (p<0.001). On the Hospital Anxiety and Depression Scale (HADS), the MS group showed significantly higher scores than controls for depression (p<0.001), but not anxiety (p=0.37). Thirty patients were classified as cognitively impaired and 75 as unimpaired. In the control group only 3 of 40 participants were classified as cognitively impaired. Cognitively impaired patients showed significantly worse working memory on the digit-span test than healthy controls (p<0.01), but there were no significant differences between those who were cognitively unimpaired and healthy controls (p=0.23). The MS group had longer deliberation times (p=0.002) and worse risk adjustment (p=0.003) than controls, but there were no significant group differences on amount bet, impulsivity or rational-choice components. Similar findings were observed when comparing cognitively impaired patients to controls and those who were cognitively unimpaired to controls, with slower deliberation (p<0.001 and 0.040, respectively) and worse risk adjustment (p<0.001 and 0.020, respectively). In addition, those with MS who were cognitively impaired performed worse on the rational-choice component than controls (p=0.037). Impairment on one or more CGT components was seen in 30% (31/105) of patients and 12% (5/43) of controls. Impairment on one or more CGT components was more common in SPMS (46%, 12/26) than controls (χ2 test, p=0.001), but did not significantly differ between controls and RR (23%, 14/61) or PP 28% (5/18) patients (p=0.14 and p=0.12, respectively), or between the MS subtypes. Age was not significantly correlated with any decision-making component in people with MS or controls. The group differences in decision-making remained significant after controlling for age and gender. In the MS group, the executive function z-score correlated with rational-choices (r=0.28, p=0.005), deliberation time (r=−0.32; p=0.002), and showed a non-significant trend for an association with risk-adjustment scores (r=0.23, p=0.02). Similarly, memory z-scores correlated with deliberation time (r=−0.31, p=0.003), amount bet (r=−0.26, p=0.01) and risk-adjustment scores (r=0.40, p<0.001), and showed a non-significant trend for an association with rational-choices (r=0.21, p=0.04). Information processing speed on the SDMT correlated with deliberation time (r=−0.37, p<0.001), and showed non-significant trends for associations with amount bet (r=−0.20, p=0.04) and risk-adjustment (r=0.23, p=0.02). Higher anxiety scores correlated with lower rational-choices scores (r=−0.20, p=0.04; ie, participants choosing the majority colour less often) but there were no other significant correlations between mood and decision-making). In those with MS, repeating the decision-making-cognition correlations after controlling for levels of anxiety (ie, partial correlations) did not affect the associations with risk adjustment or deliberation but the correlations between amount bet and memory and executive function were, however, no longer significant. In controls, risk adjustment correlated with memory z-scores (r=0.53, p<0.001), executive function z-scores (r=0.42, p=0.005) and processing speed on the SDMT (r=0.46, p=0.002). There were no other significant correlations between decision-making components and cognitive measures in controls. The MANOVA revealed significant group differences in deliberation (p=0.001) and risk adjustment (p=0.008) but not in rational-choices, amount bet or impulsivity scores (table 3). Post hoc Tukey's tests showed significantly slower deliberation times in SPMS than controls (corrected p<0.001) and patients with RRMS (corrected p=0.042). Risk adjustment was significantly worse in SPMS than controls (corrected p=0.007) and a similar trend was present in patients with RRMS (corrected p=0.06). In the whole MS group, only deliberation time correlated with duration of disease (r=0.38, p<0.001) and disability (EDSS, rs=0.23, p=0.025). Differences between SPMS and controls remained significant after controlling for age (analysis of covariance; deliberation times, p=0.003; risk-adjustment, p=0.007). The MS group had significantly smaller normalised GM volumes (ie, atrophy) than controls in the anterior cingulate (p<0.001), caudate (p<0.001) and occipital pole (p=0.001) parcellations (table 4). Compared with controls, the MS group had significantly lower DOC in the medial prefrontal (p<0.001), middle frontal gyrus (p<0.001), anterior cingulate (p=0.002) and caudate parcellations (p=0.003). On the other hand, the MS group showed significantly higher hippocampal DOC than controls (p=0.008). There was no group difference in occipital pole DOC (p=0.169). All group differences remained significant after covarying for age, gender and GM volume in each parcellation (p=0.046 to <0.001), except for the anterior cingulate (p=0.055). Multivariate ANOVAs revealed significant group differences in DOC in all parcellations except the occipital pole. Post hoc Tukey's tests showed significantly lower DOC in the medial prefrontal parcellation in RRMS (p=0.006), SPMS (p=0.028) and PPMS (p=0.030), in the middle frontal gyrus parcellation in RRMS (p=0.001) and SPMS groups (p=0.003), in the anterior cingulate in SPMS (p<0.001) and PPMS (p=0.009) groups, and in the caudate in SPMS (p=0.001), compared with controls. SPMS also showed lower DOC in the caudate than patients with RRMS (p=0.031). No other differences reached significance (after correction for multiple comparisons). Deliberation time correlated with normalised GM volumes in the caudate (r=−0.40, p<0.001) and with DOC in the medial prefrontal (r=−0.27, p=0.008), and showed non-significant trends for correlations with DOC in the middle frontal gyrus (r=−0.20, p=0.045), anterior cingulate (r=−0.25, p=0.012) and caudate parcellations (r=−0.23, p=0.021). Risk adjustment also showed a non-significant trend for a correlation with hippocampal DOC (r=−0.23, p=0.024). Figure 2 shows parcellations in which DOC correlated with decision-making components. WM lesion volume correlated with deliberation time (r=0.28, p=0.005) but not with risk adjustment. Parcellations in which associations between decision-making components and diffusion orientational complexity (DOC) changes in patients were found. Deliberation time correlated with DOC in the middle frontal parcellation and showed non-significant trends for correlations with DOC (after correcting for multiple comparisons) in the medial prefrontal, caudate and anterior cingulate parcellations (yellow). DOC in the hippocampus (green) showed a non-significant trend for a correlation with risk adjustment. In regression analyses, deliberation time was significantly related to DOC in the middle frontal gyrus (Exp(β): −0.202, 95% CI −4035.0 to −30.9; p=0.047) and medial prefrontal parcellations (Exp(β): −0.265, 95% CI −4459.4 to −664.8; p=0.009) and to normalised GM volume in the middle frontal gyrus (Exp(β): −0.214, 95% CI −5779.2 to −223.3; p=0.035) but only at trend level with the medial prefrontal parcellation (p=0.06). Risk adjustment was associated with hippocampal DOC (Exp(β): −0.226, 95% CI −2.8 to −0.3; p=0.019), but not with GM volume in any parcellation (all p>0.09). Caudate GM volume was a better predictor of deliberation time (Exp(β): −0.409, 95% CI −10836.5 to −4370.8; p<0.001) than caudate DOC (p=0.60). Previous studies have shown impaired decision-making in people with MS but have not clarified which components are most affected.1 ,2 ,4 ,11 In this work, we found that gauging risk and adapting accordingly (risk adjustment), and slow deliberation rather than impulsivity, are the primary features of impaired decision-making in MS. We found no evidence for increased impulsivity in MS, in keeping with studies using implicit tests of impulsivity28 and Go/No-Go tasks.29 We found that decision-making impairments were twice as common in people with RR and PPMS than healthy controls, and almost four times more common in people with SPMS. This is in line with studies suggesting that decision-making impairments may be more common in people with definite MS and some disability, than those with clinically isolated syndromes, or early stable MS with low levels of disability.2 ,30 We also found abnormal diffusion MRI measures to be associated with decision-making which, to the best of our knowledge, is the first time that brain structural abnormalities have been directly linked with decision-making deficits in people with MS. In our study, impaired decision-making was most common in SPMS, and similar in those with RR and PPMS. This is similar to the results for cognitive impairment, which was associated with decision-making deficits, although the PPMS subgroup performed as poorly as the SPMS on many cognitive tests. While both risk adjustment and deliberation time correlated with executive function, information processing speed on the SDMT and memory, suggesting a role for cognitive disturbances in decision-making difficulties in MS, decision-making was impaired in people with and without cognitive impairment. Anxiety also affected decision-making, increasing the number of irrational-choices, which is in line with previous findings.31 Increased anxiety levels mediated the relationship between amount bet on the CGT and cognitive variables, but did not account for the associations between risk adjustment or deliberation and memory, executive function or information processing speed on the SDMT. The finding that memory, executive function and SDMT performance correlates with aspects of decision-making highlights the point that lesions and other forms of pathology in MS are likely to affect broad networks (eg,32). The resulting aberrant connectivity among widely distributed brain regions may impact on networks involved in decision-making and cognitive functions (as suggested by our findings). Future work can help to unravel the impact of pathology on specific networks in MS.
We found that disease duration was associated with deliberation time but not risk adjustment, suggesting that different decision-making components may relate to, at least partly, independent pathological processes. This is consistent with findings from patients with traumatic brain injury, in whom correlations between decision-making components and structural changes varied between GM regions.23 In MS, neurodegeneration associated with progression (leading to atrophy and microstructural changes) may combine with focal cortical demyelination,33 particularly in outer cortical regions,34 or metabolic changes in GM,35 to produce greater decision-making deficits than either alone. We found increased MD in all GM parcellations, but reduced FA only in the hippocampi and occipital poles (see online supplementary material), and decreased DOC in all parcellations except the hippocampi (where it was higher) and occipital poles (no difference). Impaired risk adjustment has previously been linked to focal insula lesions17 and to increased apparent diffusion coefficients in the thalamus and striatum in patients with traumatic brain injury.23 We found correlations between risk adjustment and memory in people with MS and controls, indicating that poor memory (eg, for past outcomes) may influence risk adjustment, which may explain the observed association with hippocampal DOC. Deliberation time was associated with DOC in the medial prefrontal cortex, middle frontal gyrus, anterior cingulate and caudate. This indicates that relatively widespread GM pathology can affect deliberation times. Confirming previous work,36 we also showed that WM lesions are linked to slowed processing, which can impact on decision-making times. Regional specificity was supported by the lack of significant correlations between occipital pole DOC and decision-making components. While decision-making scores in the MS group were mainly associated with DOC measures, and only caudate volume correlated with decision-making, GM atrophy explained significant additional variance in regressions, suggesting that DOC and GM atrophy provide complementary information which is associated with functional changes. The neural networks subserving decision-making, and in particular the cortical areas involved, are well documented. Since the aim of this study was to explore the relevance of cortical pathology in decision-making it was advantageous to select these areas a priori with the proviso of including another area as control (occipital cortex). Future work can examine associations between decision-making and regional GM density changes throughout the brain and longitudinal studies can help determine whether reduced DOC and atrophy are related or independent processes, and assess how these changes associate with evolving decision-making and cognitive deficits. Some limitations to our study should be mentioned. In this exploratory study we selected regions of interest based on published evidence of impaired decision-making in different neurological and control populations and volumetric and diffusion changes may also have been present in other GM areas. Similarly we did not consider the contribution of normal appearing WM pathology to decision-making and future studies are needed to address these questions. The diffusion MRI measures were obtained at the highest clinically possible resolution (2 mm isotropic), but given the thickness of the cortex (2–5 mm thick) partial volume effects could have affected results. We addressed this by using high-resolution T1-weighted scans to segment brain tissues, a high threshold (50%) for classifying voxels as GM and by building regression models with diffusion and volumetric measures. Moreover, the regional volumetric and diffusion differences make it unlikely that our results are due to partial volume effects alone. Last, our progressive MS subgroups were relatively small (26 SPMS and 18 PPMS). While this represents the largest study of decision-making in people with progressive MS to date, the differences we observed would benefit from replication in larger samples. In summary, risk adjustment and speed of decision-making were impaired in people with MS, with greater deficits in SPMS than RRMS and less severe impairments in PPMS than SPMS, despite similar levels of physical disability. Decision-making impairment was seen in people with MS who did not show other cognitive deficits and specific testing is required to detect this clinically relevant impairment. In our MS group, abnormalities in GM tissue microstructure (as demonstrated by DOC) were more closely related to impairment in decision-making than measures of GM atrophy. NM, DC, LC, GJMP, CW-K, DM and MR designed the study and wrote the paper. VS and HH contributed to the data analysis. TY provided important intellectual input to the paper.
. Altered decision-making in multiple sclerosis: a sign of impaired emotional reactivity? Ann Neurol 2004;56:787–95.
. The effects of reward and punishment contingencies on decision-making in multiple sclerosis. J Int Neuropsychol Soc 2006;12:559–65.
. [Assessment of decision-making capacity in primary and secondary progressive multiple sclerosis]. Neurologia 2009;24:94–7.
. Progressive decline of decision-making performances during multiple sclerosis. J Int Neuropsychol Soc 2009;15:291–5.
. The relationship between risk attitude and treatment choice in patients with relapsing-remitting multiple sclerosis. Med Decis Making 2002;22:506–13.
. Asymmetric functional roles of right and left ventromedial prefrontal cortices in social conduct, decision-making, and emotional processing. Cortex 2002;38:589–612.
. Deciding advantageously before knowing the advantageous strategy. Science 1997;275:1293–5.
. Impaired decision making related to working memory deficits in individuals with substance addictions. Neuropsychology 2004;18:152–62.
. Decision-making processes following damage to the prefrontal cortex. Brain 2002;125(Pt 3):624–39.
. Emotion, decision making and the orbitofrontal cortex. Cereb Cortex 2000;10:295–307.
. Cognitive deficits in multiple sclerosis correlate with changes in fronto-subcortical tracts. Mult Scler 2008;14:364–9.
. Choosing between small, likely rewards and large, unlikely rewards activates inferior and orbital prefrontal cortex. J Neurosci 1999;19:9029–38.
. Neural computations associated with goal-directed choice. Curr Opin Neurobiol 2010;20:262–70.
. Preference by association: how memory mechanisms in the hippocampus bias decisions. Science 2012;338:270–3.
. Neural systems responding to degrees of uncertainty in human decision-making. Science 2005;310:1680–3.
. Dissociation Of working memory from decision making within the human prefrontal cortex. J Neurosci 1998;18:428–37.
. Differential effects of insular and ventromedial prefrontal cortex lesions on risky decision-making. Brain 2008;131(Pt 5):1311–22.
. Hold your horses: impulsivity, deep brain stimulation, and medication in parkinsonism. Science 2007;318:1309–12.
. Diffusion MRI-based cortical complexity alterations associated with executive function in multiple sclerosis. J Magn Reson Imaging 2013;38:54–63.
. Fast free-form deformation using graphics processing units. Comput Methods Programs Biomed 2010;98:278–84.
. Parcellating the neuroanatomical basis of impaired decision-making in traumatic brain injury. Brain 2011;134(Pt 3):759–68.
. An automated labeling system for subdividing the human cerebral cortex on MRI scans into gyral based regions of interest. Neuroimage 2006;31:968–80.
. Symbol Digit Modalities Test. Western Psychological Services, Los Angeles, 1982.
. Neuropsychological Assessment. Oxford University Press, New York, 2004.
. The adult memory and information processing battery (AMIPB) Test Manual. St James University Hospital, Leeds, 1985.
. Neuropsychological similarities and differences among Huntington's disease, multiple sclerosis, and cortical dementia. Arch Clin Neuropsychol 1998;13:721–35.
. fMRI investigation of disinhibition in cognitively impaired patients with multiple sclerosis. J Neurol Sci 2009;281: 58–63.
. Preserved decision making ability in early multiple sclerosis. J Neurol 2008;255:1762–9.
. Anxiety impairs decision-making: psychophysiological evidence from an Iowa Gambling Task. Biol Psychol 2008;77:353–8.
. Impaired small-world efficiency in structural cortical networks in multiple sclerosis associated with white matter lesion load. Brain 2009;132:3366–79.
. Clinically feasible MTR is sensitive to cortical demyelination in MS. Neurology 2013;80:246–52.
. Memory in multiple sclerosis is linked to glutamate concentration in grey matter regions. J Neurol Neurosurg Psychiatry 2014;85:833–9.
. Contribution of cortical and white matter lesions to cognitive impairment in multiple sclerosis. Mult Scler 2013;19:1290–6. Funding This work was supported by the MS Society of Great Britain and Northern Ireland; UK Department of Health's NIHR Comprehensive Biomedical Research Centre at UCLH and UCL; Philips Healthcare, Clinical Science Group (Best, NL). Competing interests DC has received: honoraria (paid to his institution) from Bayer, Teva and the Serono Symposia International Foundation for faculty-led education work, and Teva for advisory board membership; and support for conference attendance from Teva. He holds stock in GlaxoSmithKline. NM is funded by a Wellcome Trust ISSF fellowship. DC has received research support from the MS Society of Great Britain and Northern Ireland, and the UCLH/UCL NIHR Biomedical Research Centre. Ethics approval This study was approved by our local UCL Research Ethics Committee.